In our teeny tiny farmhouse, the kitchen is by far the largest room. I have been rummaging through magazines, design blogs and books looking for inspiration. Below are pictures of kitchen that have caught my eye. There isn’t one specific picture that makes me say “THAT’S IT! THAT IS THE KITCHEN I WANT!” However, each picture holds something that speaks to me and a small idea that I would like to incorporate into our farmhouse kitchen. We are not going to do a complete renovation. Just going to ‘spruce’ things up a bit….or at least that is the plan as of now….who knows what will happen if I keep perusing these magazines and design blogs!?! Since we have a itsy bitsy farmhouse to renovate..or should I say ‘update’, I have been scouring cottage living magazines and design blogs. I even have a friend searching for my perfect modern kitchen online. From time to time, I come across something that is PERFECT for the farmhouse. Today is one of those times. 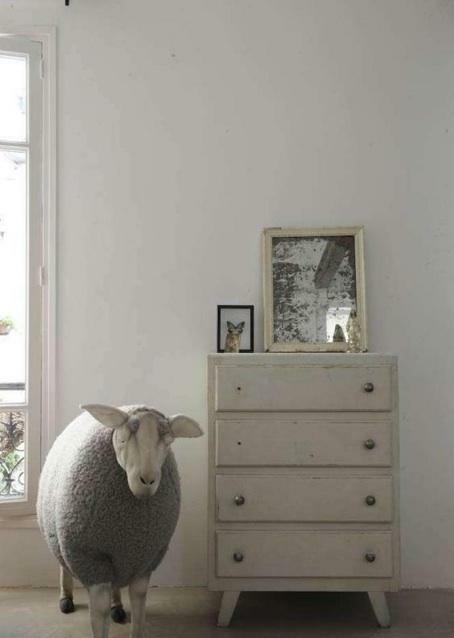 Behold…I give you indoor sheep! Above: Photo via the Living Agency.